We specialize in bridal gown cleaning and wedding dress preservation. 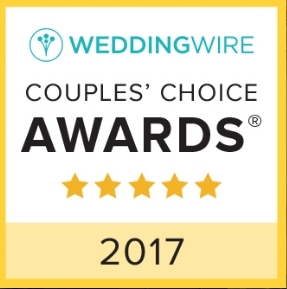 Village East Cleaners have been providing our special Wedding Dress Preservation services to brides since 1978, and our cleaners have been certified by the Association of Wedding Gown Specialists. When you preserve your wedding gown with us, we are the only place in Nevada which is authorized to offer a Lifetime Guarantee against yellowing and sugar stains which is honored at over 500 locations in the US, Canada and Mexico. First, we are pleased to offer you a FREE, personalized consultation with one of our Wedding Gown Specialists in a dedicated Bridal Salon environment. There is no obligation to leave your gown with us….. …..But, most brides do after learning about our cleaning and preservation processes. When cleaning and preserving a wedding gown, we treat the gown as the heirloom that you want it to be. We understand what it takes to be able to offer a life time guarantee against yellowing and sugar stain damage. After cleaning, your gown will be carefully packed into the correct size 100% acid free Preservation Chest. It is important that the preservation chest is matched to the size and style of the dress. Improper packaging can result in future damage and in this case “size matters.” Also, 100% acid free tissue paper is backed between the folds of your gown to keep it from having creases when you unpack it many years later. 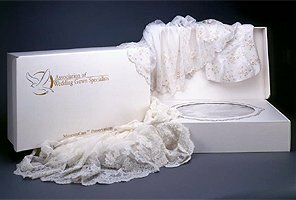 All of our wedding gown preservation chests have an acid free window so that you may view your gown at any time. We also include a pair of white cotton gloves should you have the need to open the chest to handle your gown. Please note, all materials we use are 100% acid free, NOT just PH neutral. This is an important difference between us and many other gown preservation companies. When you pickup your cleaned and preserved wedding gown, we will provide you with a written warranty and a sheet of written instruction for the proper long term storage of your gown.